Now you can have more storage, unequaled convenience and space to spare. 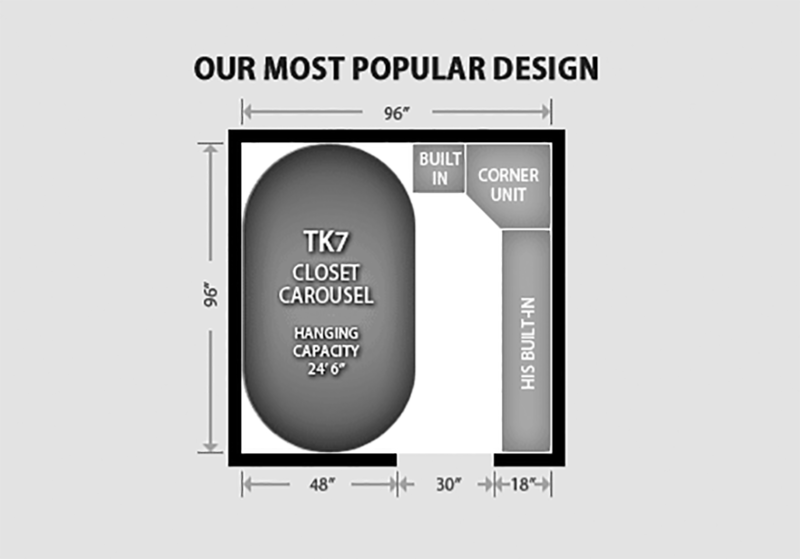 The revolving closet carousel makes existing closet space more efficient and new closet space both practical and luxurious. In the closet layouts that follow you’ll see just how the Rotating Closet can work in your home. It’s just as effective in long, narrow spaces as it is in large walk-ins. The automated Closet Carousel transforms hard to get to spaces into useful storage areas. Take a look at these standard closet layouts and see if one fits your needs, if not, just get in touch with us and we’ll design a custom closet just for you!